Before there were vegan strip clubs and chickens named Colin, cinnamon-and-sugar crusted elephant ears were the only thing you order from a trailer in Portland (while shopping for rainbow kites and jewelry forged from bent spoons at Saturday Market, of course) and shunning animal products meant ordering drive-thru 7-layer burritos without the sour cream and cheddar cheese. Yet despite the last millennium lack of barrel-aged cocktails, foraged lichen or whole animal butchery, residents managed to dine out every now and then. In fact, some of these old guard establishments are still in business and presumably maintain a loyal following. Presumably, because I’ve only been back to Portland three times in nearly 16 years so it’s not as if I’m keeping tabs on the current state of near stalwarts. And this is not exactly about the food anyway; longevity and memories count for something too. Don’t worry, FWx kids. Someday everything you once loved will also disappear. First small plates, then communal seating…and then we’ll all die. Ok, bye! P.S. RIP Quality Pie, Circus Burger, Pizza Oasis, Yankee Pot Roast, Macheezmo Mouse, and Taste of Bali. P.P.S. No one ever uttered or wrote “Keep Portland weird” in my multi-decade Portland lifetime. 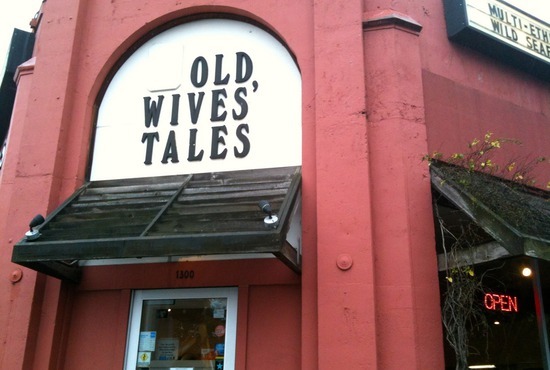 Old Wives’ Tales is totally where the feminist bookstore womyn would eat, yet also could function as a meeting place for your meat-and-potatoes mom. In retrospect, it seems a little crunchy though at the time it just felt like a regular restaurant. The brightly muraled kids playroom and muted mint green and dusty rose color palette is still in effect and would somehow be more at home in a second-tier city in the state or the Oregon Coast. Frankly, the food is kind of boring—I only ever ate the Hungarian mushroom soup and salad bar and rosemary chicken sandwich. They appear to have added a Mt. 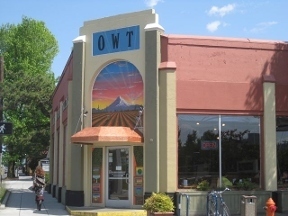 Hood painting to the facade and attempted to cool-up the name with the acronym OWT. That is too much. La Sirenita’s arrival on N.E. Alberta when it was still a dead zone, taking the bus out there seemed sketchy and prostitutes would approach my car at night, marked the dawn of New Portland. 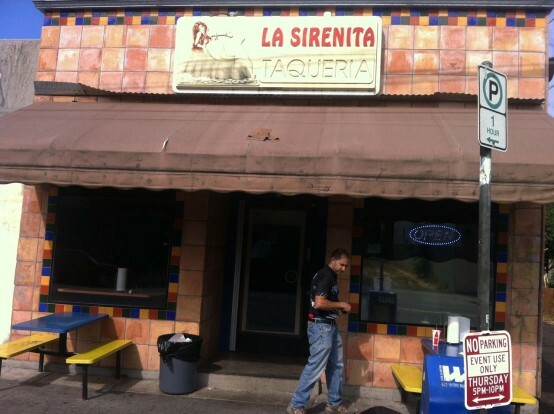 I rarely eat burritos now that I’m civilized, but no one ate tacos at this taqueria, which was actually Mexican and not gross spinach, brown rice and non-dairy cream cheese hippie-mex. In fact, there was no rice at all in these burritos (though the menu now indicates otherwise) or even cheese. They were also not Mission-style, nor any style I’ve since encountered. Maybe five inches long, and nearly as wide, these flour tortilla parcels were crazy dense and filled with lardy refried beans and meat (carnitas always) so greasy it would ooze orange through the bag and onto every surface. I don’t think these burritos cost more than $3 either; even now they are only $4. 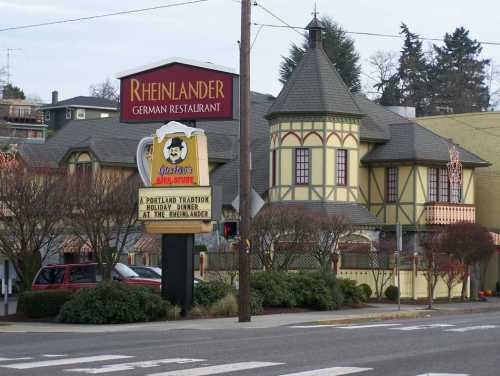 Rheinlander is where we would occasionally have family celebrations and where I went for my high school graduation dinner. My oversized Tasmanian Devil t-shirt-wearing former step-sister that I’ve had no contact with for over a decade once asked for more sautéed mushrooms with her jagerschnitzel like a methy Oliver Twist and they actually complied. 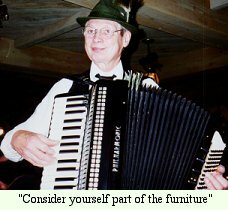 This was only slightly less humiliating than her uncle who insisted on a beer-whisky drink that he’d had in the service even though the non-German waitress had no idea what he was growling on about. Rheinlander’s selling point was a sharp cheese fondue served in a cast iron pot, which I now know is Swiss not German, but whatever. The even more TL, DR version here. Hung Far Low gets attention from its unintentionally ribald name. 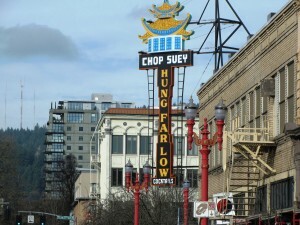 It’s not even in Old Town/pseudo-Chinatown anymore (which isn’t called Old Town anymore—Pearl District what?) 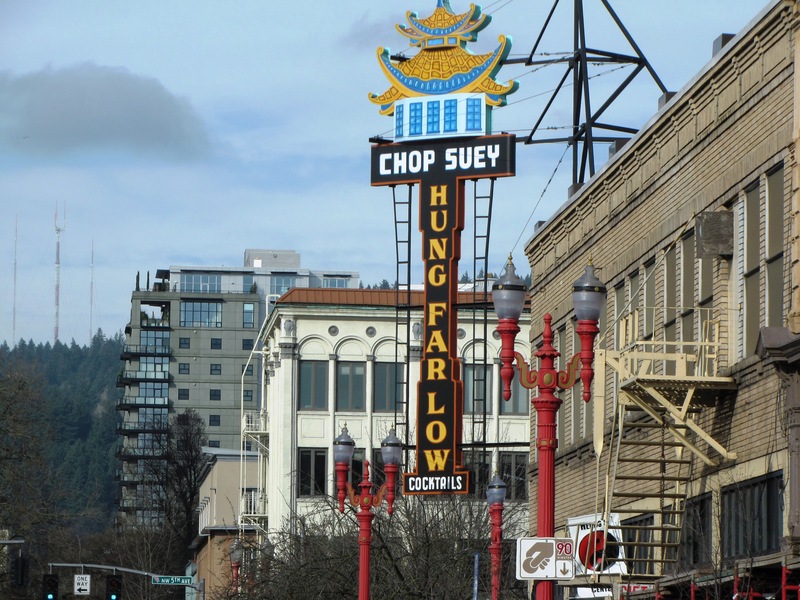 and lost the classic chop suey sign, which means it’s kind of dead to me, but I will always think of the dark vinyl booth lounge (no one ate in the restaurant) fondly. It was my specter of a boyfriend’s (I’m not even dating 44-year-olds now) haunt where we’d drink whiskey sours (me) and greyhounds (him) and eat late-night General Tso’s chicken. You would always run into someone you knew here. When I fell and broke my tailbone and was off work for over two weeks, I recuperated enough to go out but didn’t tell anyone and was spotted at Hung Far Low by a coworker like in those hidden camera workers’ comp sting operations. Chu’s Eatery Frankly, I’m beyond shocked that this column A, column B Chinese-American restaurant still exists. In middle school, I briefly lived in the divorced families apartment complex across the street, but was too young to dine on my own. By driving age, and back in a two-parent house, my sister and I would occasionally visit for a cashew chicken combo that contained more chopped celery and carrots than meat or nuts. The adjoining lounge always seemed a bit tawdry and not in a kitschy way. This wasn’t a tiki-era relic, but firmly a product of that ‘80s Northwestern bark dust moat, wooden slat style, in this case fueled by Bud Light and video poker. Because Gresham is/was a small town, I heard from a non-friend high school classmate that her mom had been at Chu’s and was upset by a group of rowdy kids with skateboards including me. She was wrong, though; the weirdo we were with was a 25-year-old man. During this period I also started my first job bussing tables at a restaurant very much like Chu’s called Hunan Garden. Crab rangoon is in my veins. 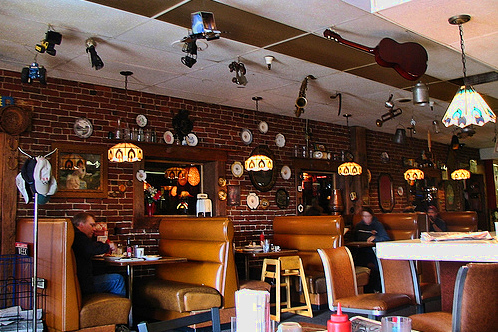 My Father’s Place This would be as if Chu’s lounge was just one big restaurant that served reuben sandwiches and was patronized by proto-hipsters. I imagine it’s exactly the same now minus the proto part. Taco Time Burgerville is the local chain that gets the most attention, but I’m pretty sure they didn’t rebrand as fresh, seasonal and sustainable until the 2000s. 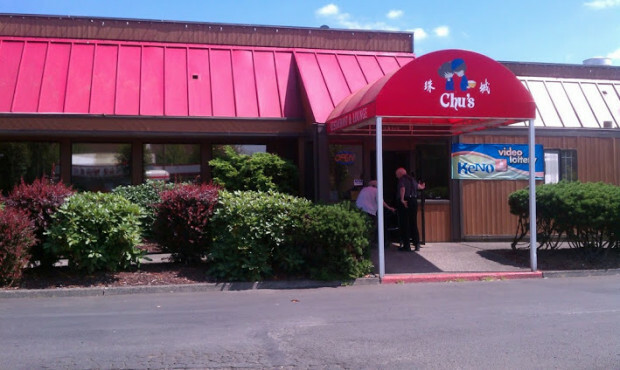 It used to be a burger joint plain and simple. 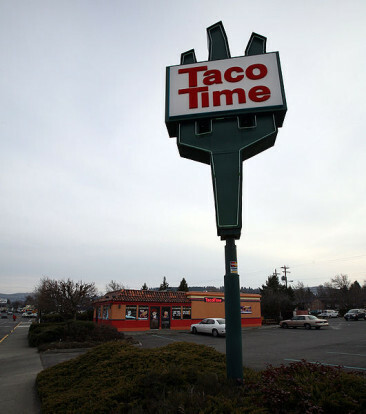 Taco Time describes itself as an “upscale quick service restaurant chain that specializes in freshly prepared, home-style Mexican fare” on its website, which is completely untrue. You go there for tightly rolled fried burritos, half flauta, half chimichanga, now called Original Crisp Burritos, and lightly spiced tater tots a.k.a. Mexi-Fries. 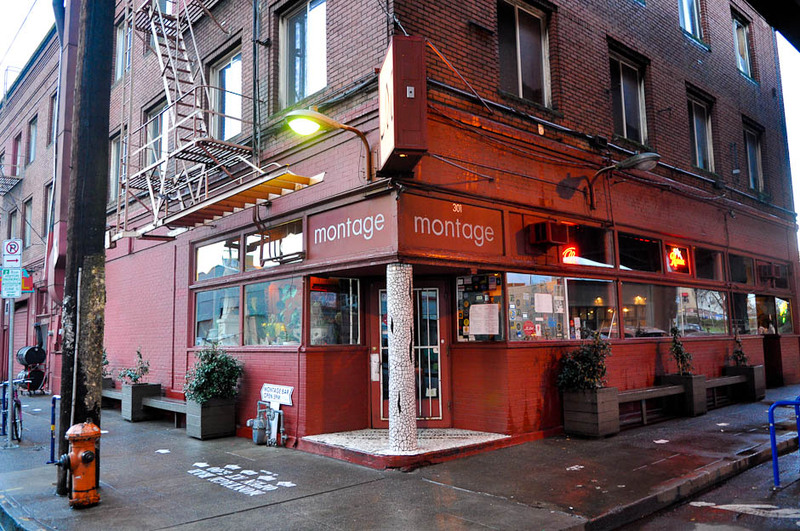 Montage Technically Le Bistro Montage, the restaurant, which I never thought of as Cajun, but kind of is, is currently located in what’s now called the Central Eastside Industrial district. It used to be on Belmont and was kind of a big deal to be open until 3am on weekends, considering bars and most everything close at least an hour before that. 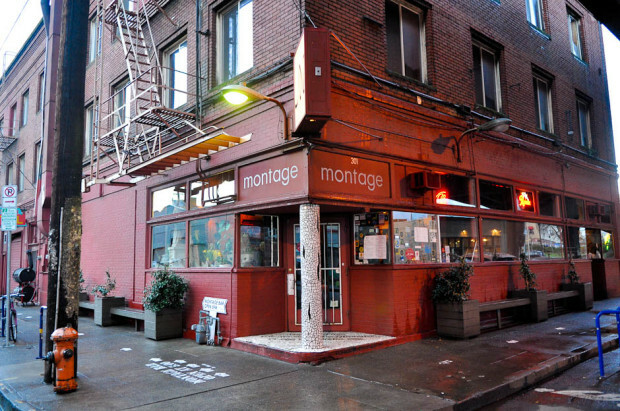 With white tablecloths and non-paper napkins, Montage seemed like a fancy restaurant—and certainly a step up from burritos and egg rolls—but wasn’t expensive. It was also the first place where I encountered foil animals for leftovers. There is also an argument that could be made for Higgins, Wildwood and Paley’s Place, but those were far too grown-up and expensive for me to have any first-hand knowledge.